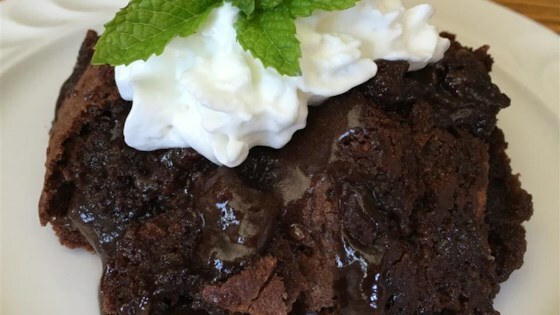 "If you love chocolate, you will love this recipe. Serve with whipped cream or ice cream." Preheat oven to 325 degrees F (165 degrees C). Grease and flour an 8x8 inch pan. In a food processor or blender, beat eggs for 2 minutes. In a large bowl, mix together the sugar, flour, cocoa and salt. Slowly beat in the whipped eggs. Beat in the butter and vanilla. Stir in the chopped pecans. Spread batter in prepared pan. Bake in the preheated oven for 45 to 50 minutes, or until a toothpick inserted into the center of the cake comes out clean. Allow to cool. This recipe is not supposed to be like normal fudge. It is supposed to be hard on top and goey in the middle. This taste awesome! This was the most delicious chocolatey, fudgey cake we have ever eaten!! YUM!! I used a glass pan, and added about 25 minutes baking time, checking at 5 minute intervals. OMG this is so GOOD! Followed the recipe exactly. added a few minutes of cooking time (about 10 extra min.) WILL MAKE AGAIN! Fantastically scrumptious! Wonderful recipe for brownies. I baked 45 min. and then covered it and baked for another 15 min.Tastes great with ice cream. Not that great. Texture wasn't good.